Distribution and habitat: Chrysanthemums are perennial flowering plants which are native to Asia and northeastern Europe. Description: Chrysanthemum morifolium is herbaceous plant with deeply lobed, dark green upright leaves and large flower heads can be yellow, white, purple or red. The plant is 0.30–0.91m (1–3 feet) high and wide. The Chrysanthemum morifolium is inspiring with a lots of beautiful flower forms and colours to choose from. Favorites for autumn colour once most other annual or tough perennials have past in rest period, Chrysanthemum morifolium will bloom until late in the winter season. Florist Chrysanthemum morifolium varieties are not hardy for growing outdoors in cold climates. Unfortunately, it is difficult to get Chrysanthemum morifolium to rebloom, so it is treated as an annual and tossed out after the blooming season is over. Plant it outdoors in the spring to possibly get another season of blooms. Houseplant care: Care for the potted Chrysanthemum morifolium (often used as annuals) is quite easy, while garden Chrysanthemum morifolium treated as perennials require a little more dedication. Faded blooms of potted Chrysanthemum morifolium should be removed to prolong flowering. Pinch them off as close to the stem as possible and Chrysanthemum morifolium will quickly form new blossoms instead of using nutrients to form seeds. Also, Chrysanthemum morifolium grown indoors require good air circulation. The secret to keeping blossoms fresh for several weeks is to keep Chrysanthemum morifolium in a cool place and well-watered. Light: Keep Chrysanthemum morifolium in natural bright light or in direct sunlight, whether indoors or out. Chrysanthemum morifolium need plenty of sun for proper growth. Keep them away from night lighting, as this disturbs their flowering cycle. Unlike other houseplants, Chrysanthemum morifolium requires natural light for healthy growth. This plant loves bright light and to encourage buds to open, it will need to be placed in a spot near an open window with direct sunlight. Water: Water Chrysanthemum morifolium regularly throughout the year. Soak the pot of Chrysanthemum morifolium until water runs out through the drainage holes of the pot bottom. After the initial soaking, water daily or until soil is moist. Apply enough water to moisten the soil, yet not enough to leave it wet and soggy. Do not allow the potted soil to dry out, as this will harm the plant. It is advisable to water the potted Chrysanthemum morifolium with warm (not too cold) water. An average room humidity will be good enough for Chrysanthemum morifolium. If the room is dry, use a spray bottle to mist potted Chrysanthemum morifolium plants once per day to increase the relative humidity. Temperature: The potted Chrysanthemum morifolium will do well in cool temperatures 13-18°C (55-65°F) rooms; Flowers may not last as long if kept in a warm room. Fertilise: Fertilizing is needed before the blooming period. Use a fertilizer that is high in potassium and nitrogen as it will promote a larger number of flowers and increase the size of the blooms. Water both before and after applying the fertilizer to prevent root burn. Follow the manufacturer’s instructions for correct fertiliser dosage. Do not fertilize during the rest period which will occur in the winter months. Potting and repotting: Repot Chrysanthemum morifolium in the fall using an fertile soil mixture and prune the plant. Choose a container with drainage holes. Plant Chrysanthemum morifolium in a 18cm (7 inch) container that will accommodate the root ball comfortably. Use a growing medium made up of two parts potting soil, one part peat moss and one part organic compost. Keep the potted Chrysanthemum morifolium in a location that receives full morning sun and partial afternoon shade during the first year of growth. For spent Chrysanthemum morifolium pot: Allow the Chrysanthemum morifolium plants to go dormant over the winter. Keep Chrysanthemum morifolium pot outside once the blooms die and mound the pots with dried leaves or garden refuse to prevent premature freezing. Prune Chrysanthemum morifolium in the late winter or early spring before new growth begins. Cut back stems to about 30 to 45cm (12-18 inch) or shorter for bushier plants. Water mum plants in the spring as new growth begins and color returns to the plants. Keep them well watered throughout the spring, fertilizing once a week for the first couple months and then ceasing fertilization once blooms are present. Garden Culture: Plant perennial garden Chrysanthemum morifolium during spring in full sun for optimum root establishment prior to winter. Choose a site with well-drained soil. Let 15-30cm (6-12 inch) space between bedded Chrysanthemum morifolium to allow for growth and air circulation. Tall cultivars may grow up to 0.9m (3 feet) tall, while dwarf varieties remain low and bunchy. Prepare perennial garden Chrysanthemum morifolium for winter by mulching with up to 10cm (4 inch) over the plant. Do not cut back stems until spring to encourage overwintering success. In spring, remove the mulch from the beds of over-wintered Chrysanthemum morifolium and cut back dead plant material. Fertilize regularly during the early spring growing season to encourage late summer and fall blooms. Pinch back one-third of the new growth at a leaf bud junction up to three times during the summer prior to flowering. This routine maintenance creates a full, round perennial bush that will produce beautiful fall display in the garden. Water the Chrysanthemum morifolium every other day when the soil becomes dry. For strong growth remove any lateral branches and leave the plant with only three stems to help developing buds. The branches should be removed when they are small and soft so as not to take away from the growth of the buds and stems. Propagation: Chrysanthemum morifolium can be easily propagated through stem cuttings or root ball division. Take cuttings in early spring and root in soil mixture with sand on the surface, at 16°C (61°F). Place in a cold frame with ventilation and harden off in mid-spring. Divide Chrysanthemum morifolium plant as needed in spring or fall after flowers are finished. Problems: Chrysanthemum morifolium can be attacked by aphids, earwigs, nematodes, capsid bugs, leaf miners, whiteflies, thrips, and spider mites. Potential disease problems include Botrytis, leaf spots, rust, powdery mildew, stem and root rots, verticillium wilt, aster yellows and viruses. Uses: Chrysanthemum morifolium is used in beds, as cut flowers, for planters, as pot plant, display or borders. Blooming houseplants are one way to add colour into any décor. Plants that are constant bloomers will keep a room lively. Chrysanthemum morifolium is one of the most popular plants available for providing long-lasting flowers to enjoy indoors or on porches and patios. The wide variety of flowers colours suit just about any indoor décor or patio planter colour scheme. 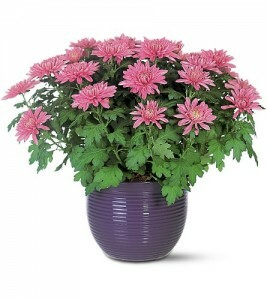 Chrysanthemum morifolium can be grown in larger pots indoors or outdoors in the summer months. Chrysanthemum morifolium make colorful table plant or window plant. It is perfect for all kinds of containers and makes a breathtaking potted specimen plant. Also, Chrysanthemum morifolium can be used for eye catching thematic arrangements, garlands, buttons, etc. Interior decoration with flower arrangements is most important use of Chrysanthemum morifolium as cutting flower due to long vase life of the flower. Well known as a decorative flower, the Chrysanthemum morifolium is an amazing plant, which has not only beautiful flowers, but is also very good at filtering a variety of polluting compounds from the air. Chrysanthemum species are very effective at removing benzene, a carcinogen (cancer-causing substance) associated with most chemicals, plastics, cigarettes and off-gasing. Also removes trichloroethylene (found in solvets and cleaners), formaldehyde and ammonia. Note: Chrysanthemum morifolium leaves are poisonous. Keep it out from children and pets to avoid the risk of ingest it. Availability: Potted Chrysanthemum morifolium is available from late summer to fall when the plant will already have bud sets ready to bloom when purchased from retailers. Choose a plant with plenty of buds that are just beginning to open to enjoy about 6-8 weeks of blooms.